Everybody seems to be talking about climate change. Whether all these heavier rains and unrelenting summers are a result thereof. Or if this global warming phenomena is even actually a myth. I say it’s been really hot. Freakishly so in that the past summer months, I’ve never remembered Manila reaching highs of near 40 degrees. Though its been raining of late, temperatures still remain warm even during cloudy days and evenings. What I like drinking in the hot weather, though, is this beverage I like to refer to as the Asian electrolyte drink. Not Pocari Sweat, though that is tasty too despite the name. But a drink anyone can make as its just made up of 3 ingredients. 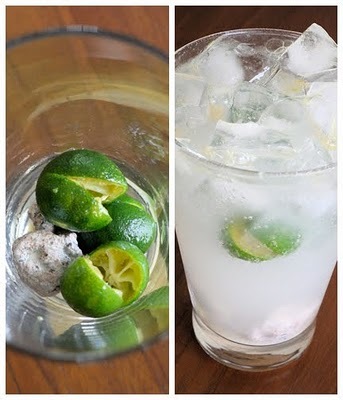 To make a serving of calamansi and sour plum cooler you will need 3 to 4 pieces of fresh calamansi; squeezed in a tall glass while straining the seeds. I like throwing in the rind for the extra flavor. 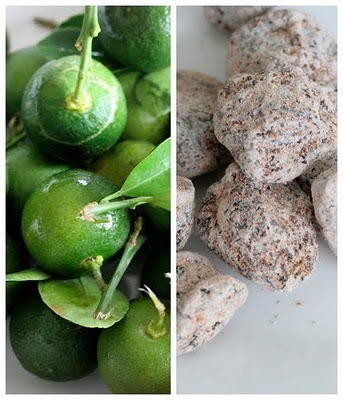 The oils impart a more intense lime essence. Then you’ll need about 3 or 4 pieces of sour plum. I get these in Aji Ichiban and it could get confusing as there are different varieties which all seem to look the same. These are known as kiamoy in general locally but take note; the white kiamoy we’re familiar with would be called salted sour plums and I think would prove to be way salty and dry. I try to avoid the red variety as well as aside from the salt content, it gives the drink a red hue as natural looking as Mickey Rourke’s dimples. However if you like drinking brackish things then this might be for you. Sour plums have a more balanced mix of sweet, salty and tartness and the flesh is more pliable. So you throw in about 3 to 4 pieces in the glass as well. Or more if you prefer a more concentrated plum flavor. Slightly muddle everything together with a bar spoon or the back of a wooden spoon, fill the glass with ice and then top off with some clear lime soda. Done. As an after dinner drink, I put in a shot or two of vodka or gin before topping off with soda. So easy and very refreshing. And the best part is when you’ve finished the drink, you can go ahead and eat the now plumped up plums at the bottom of the glass. Cool!!! Will try this out for a party!!! Thanks for the tip!